I received a question this week asking whether the shaft or grip of a club can be used to make a stroke. I cannot imagine the circumstance that led to this question being asked, but it has prompted me to list a few points relating to making a stroke at a ball. • The ball must be fairly struck with the head of the club. Rule 14-1a. • The head of the club includes the face, back and sides of the club (so, obviously not any part of the shaft or the grip). Note that the clubhead must have only one striking face, except that a putter may have two faces if their characteristics are the same and they are opposite each other. Appendix ll, 1 / 4 / d.
• The ball must not be pushed, scraped or spooned. See this blog for an example of what is not permitted in this respect. Rule 14-1a. • In making a stroke, the player must not anchor the club, either "directly" or by use of an "anchor point." See this blog for more information on this subject. Rule 14-1b. • A stroke is the forward movement of the club made with the intention of striking at and moving the ball. So if a player checks their downswing voluntarily before the clubhead reaches the ball, they have not made a stroke. Definition of Stroke. • A player must not make a stroke while accepting physical assistance (e.g. having an umbrella held over them), or protection from the elements (e.g. aligning their bag to shelter their ball from the wind. Rule 14-2a. • A player must not use any artificial device or unusual equipment, or use any equipment in an unusual manner that might assist them in making a stroke. Rule 14-3. Note that this includes listening to music or a broadcast, Decision 14-3/17. • A player must not make a stroke at his ball while it is moving. Rule 14-5. There are 3 exceptions; a) Ball falling off tee, Rule 11-3; b) Striking the ball more than once, Rule 14-4; c) Ball moving in water, Rule 14-6. A player may make a stroke at a ball that oscillates providing it does not move off its spot. • A player may make a stroke one-handed, e.g. holding the flagstick in the other hand when making a short putt, Decision 17-1/5. (See photo above). • A player is not necessarily entitled to see their ball when making a stroke. Rule 12-1. – Thanks to RVH for posting this review on Amazon 2 weeks ago. I couldn’t put it better myself! For more information click here. When making some practice putting strokes too close to the ball, I accidentally strike the ball with the toe during one of the backstrokes. What is the penalty in match play/in stroke play? How should I proceeded? Check out my blog on the subject of accidentally moving a ball on a putting green dated 13th December 2016. 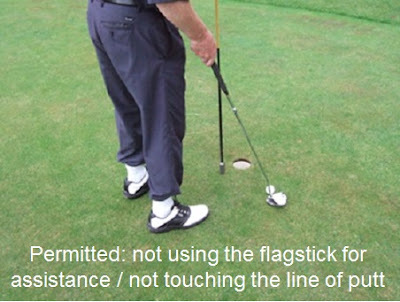 If the ball was in play, but not on a putting green, the penalty is one stroke in both stroke play and match play and the ball must be replaced, Rule 18-2. After making a putt,the player followed the ball and tapped it in while it was still in motion as he knew that he didn't put enough speed. What is the rulling, Sir?